The response to the Visualizing Isaiah series has been good by my estimation. Numerous readers have written that they enjoyed/profited by the series. Several bloggers have linked to the series and a few have re-blogged almost all of them to their readers. This was an ambitious project. First, there was the responsibility to understand Isaiah well enough to make appropriate comments. Second, the selection of good photos was quite a task. I often looked through photos from various Bible sites and/or several museums with Ancient Near Eastern collections to locate what I thought was the right image. Some chapters offered numerous possibilities; others were a bit more difficult. Hopefully I will be able to continue the series later. At this time I must take a break because I will be traveling in the Bible world most of May. I do plan to post something most days to indicate where I am traveling. I trust that the Isaiah series has illustrated how you can enhance your study and teaching with visuals. You may say, “but I haven’t been to all of those places.” But you can search this blog for illustrations. Some time back we provided illustrations for the entire book of Acts. You can go to your Pictorial Library of Bible Lands collection and find the photos you need. Or, search the Bible Places Blog, or the Holy Land Photos’ Blog, or the vast collection at Holy Land Photos, or David Padfield’s collection here. For my next series, I plan to select a shorter book such as Philemon or Jude. Just in case some of you are looking ahead to Isaiah 41, I will include an image to help with verses 15-16. 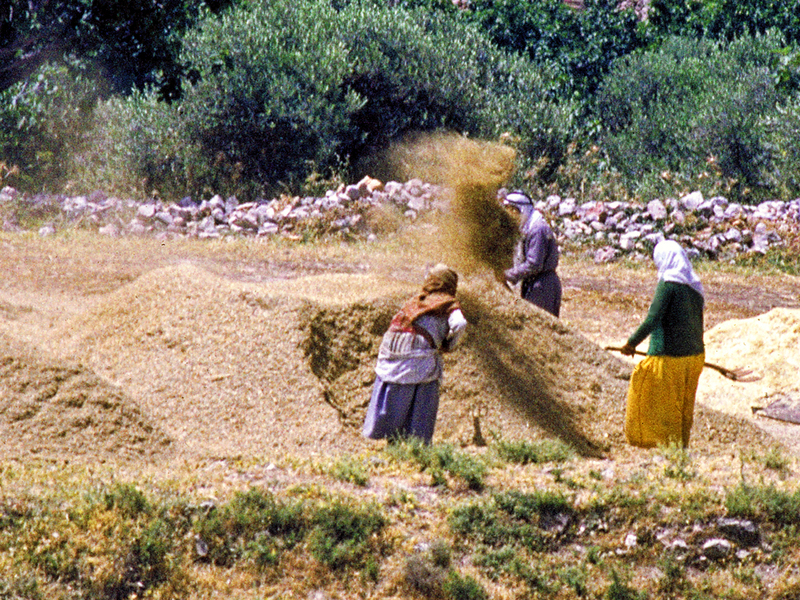 Winnowing at Shechem. Photo by Ferrell Jenkins.